M88 is conveniently located in the heart of Central District Hong Kong. It is situated in the prominent junction of Wellington Street and Wyndham Street, around the corner of Lan Kwai Fong bar area. 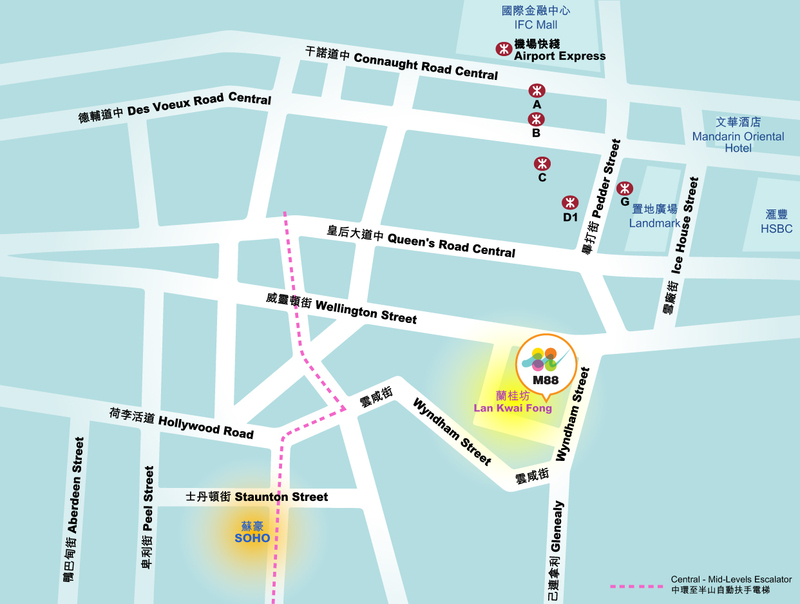 Just a few minutes walk to/from Central MTR Station(Exit D1), Landmark, Soho area, Star Ferry, Airport Express Central Station and Hong Kong-Macau Ferry Terminal. M88 is right in the heart of Central. So no matter where you are in Hong Kong, when you arrive in Central, you will just be minutes away. Taxis can stop in front of The Landmark and M88 at Wellington Street. Just get off near the Landmark in Central if you are taking buses. Then walk one block up the Queen’s Road Central to the corner of Wyndham Street and Wellington Street. Get off at exit D1 in Central Station, cross Queen’s Road Central then walk one block up to Wellington Street or Wyndham Street. If you are travelling from outlying islands, Discovery Bay, Tsim Sha Tsui or Hunghum, follow the foot bridge at Star Ferry Pier and walk all the way to the Central MTR Station. Get off at Hong Kong Station which connects to Central MTR before you exit the gate. Look for exit D1 then walk up to Wyndham Street and Wellington Street. If you are taking west-bound tram, get off at the tram stop right in front of the Landmark. If you are going east-bound, get off at Worldwide House Central MTR Station.